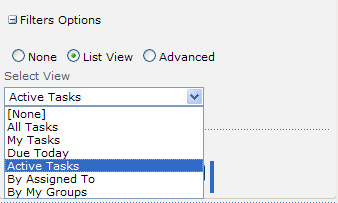 Filter options allow you to display only items which satisfy the filter. Filter can be set for every data source. 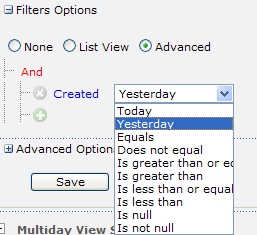 Expand “Filters Options” in the specified settings of your date source. There are two options of filters in the Mini Calendar. 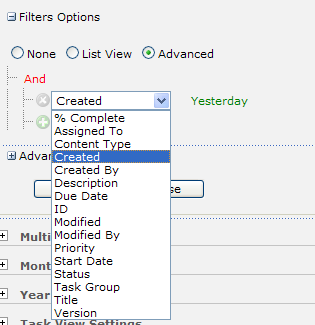 If you select “List View” filter, you will have to define list view according to which the Items will be displayed (for example, only active tasks will be shown). If you select “Advanced” filter, you will be able to define special conditions according to which items from this list will be displayed. For example, you can display only tasks created yesterday. In order to set the filet, click green icon and select “Created” and “Yesterday”. You can create conditions of any level of complexity using special operators. Do not forget to click “Save” after adjustment.